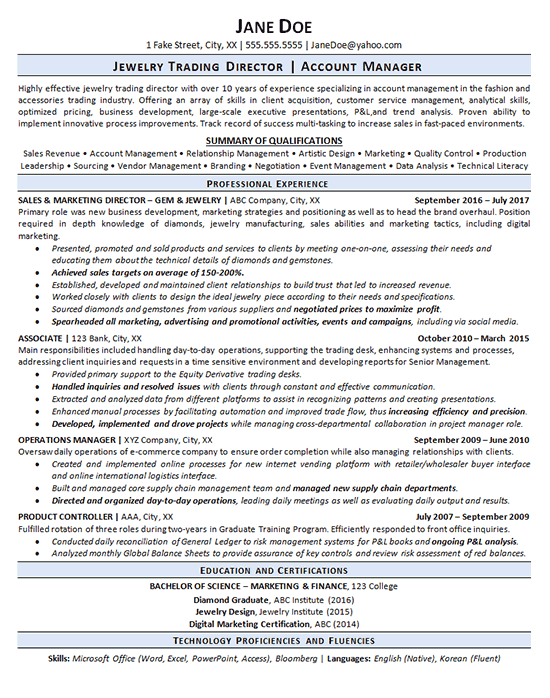 This resume was created for a client interested in securing a sales or marketing position within the jewelry industry. There are a couple gaps in employment for this client so there is a need to focus the reader’s attention on her positive qualities. To accomplish this goal, the resume began with an introductory paragraph and summary of qualification section so that the client’s best qualities are highlighted. From there, her professional experience was broken down in detail with the most impactful points written in bold font so that they stand out more to prospective employers. Additionally, job titles were written in bold and capital letters so that it hides the dates a bit to mask gaps in employment. To complete the resume, this client’s education, certifications and proficiencies were listed to give a well-rounded view of this client’s qualification for positions of interest. Highly effective jewelry trading director with over 10 years of experience specializing in account management in the fashion and accessories trading industry. Offering an array of skills in client acquisition, customer service management, analytical skills, optimized pricing, business development, large-scale executive presentations, P&L,and trend analysis. Proven ability to implement innovative process improvements. Track record of success multi-tasking to increase sales in fast-paced environments. Primary role was new business development, marketing strategies and positioning as well as to head the brand overhaul. Position required in depth knowledge of diamonds, jewelry manufacturing, sales abilities and marketing tactics, including digital marketing. Presented, promoted and sold products and services to clients by meeting one-on-one, assessing their needs and educating them about the technical details of diamonds and gemstones. Achieved sales targets on average of 150-200%. Established, developed and maintained client relationships to build trust that led to increased revenue. Worked closely with clients to design the ideal jewelry piece according to their needs and specifications. Sourced diamonds and gemstones from various suppliers and negotiated prices to maximize profit. Spearheaded all marketing, advertising and promotional activities, events and campaigns, including via social media.